Our mornings during the week are hectic, and kids need something to grab and go on their way to the bus. I catch myself sometimes grabbing something in the drive-thru on the way to work. Preparing these breakfast burritos for the week ahead gives me a peace of mind the kids have something to eat before their big day at school. Everything can be prepared in one skillet, but I ran two skillets because I had help. Kids were excited about helping, because they love to scramble eggs. Scramble 8 eggs with a little bit of water, or milk. Brown one pound of pork sausage with 1/2 onion. Peel, cut and chop 3-4 medium potatoes. Add 8 strips of crumbled bacon. Mix all cooked ingredients together, and add salt and pepper to taste. Assemble burritos and add shredded cheese on top. Wrap them carefully. This recipe made 16 burritos. After wrapping burritos, I wrapped them in saran wrap. Kids can take one from the refrigerator, and warm it up in the microwave. If you are preparing them for the freezer, wrap them in saran wrap, then aluminum foil. Scramble eggs with ¼ cup milk. Brown 1 pound pork sausage with ½ chopped onion. 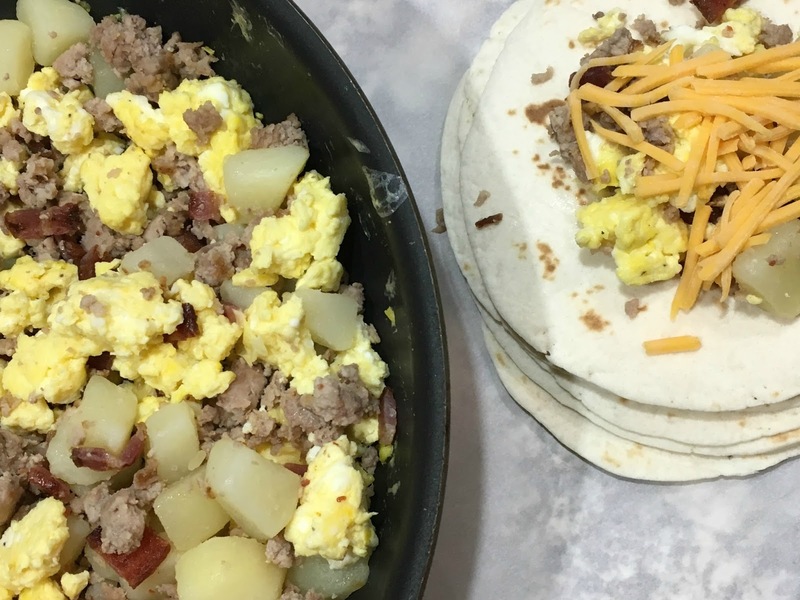 Assemble burritos with a tortilla, add eggs, potatoes, sausage, bacon, top with shredded cheese of choice. FREEZER OPTION - Wrap in saran wrap, then aluminum foil, and put in freezer. I love potatoes in my breakfast burros. SO good! Breakfast burritos are always welcomed at our hosue! 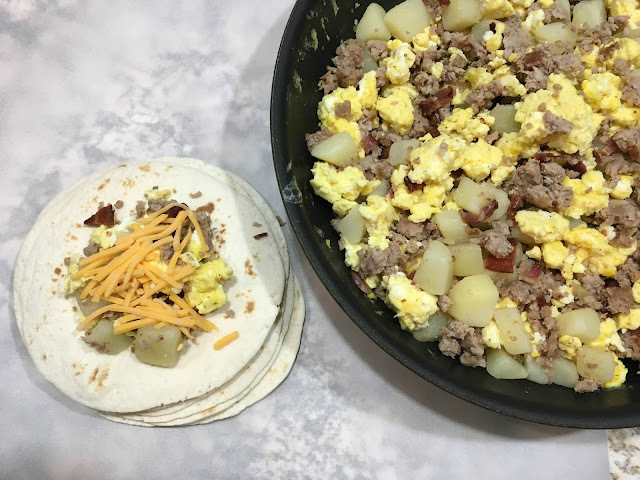 It has been a long time since I've made my own breakfast burritos! Time to change that! I love breakfast burritos! This is such a great way to plan ahead! I just love this blog! You should hire a web design agency to make a blog like this.www.citytechhq.com offers responsive design, ensure the maximum speed, and most importantly, they keep your site easy to use.